Name: The official name of the country is the Islamic Republic of Iran (Jomhuri-ye Eslami-ye Iran) but it is also sometimes referred to as Persia. Climate: Iran has a diverse climate. Winters are cold in the northwest whereas summers are very hot in the south. Iran is located in West Asia, between the Gulf of Oman, the Persian Gulf, and the Caspian Sea. It is bordered by Iraq, Turkey, Azerbaijan, Armenia, Turkmenistan, Afghanistan and Pakistan. It has been the centre of many different civilizations such as the Kassites, Mannaeans, Gutians and of course the historical conquests of adjacent regions led by the Persians have made Iran a multi-ethnic and multicultural country. 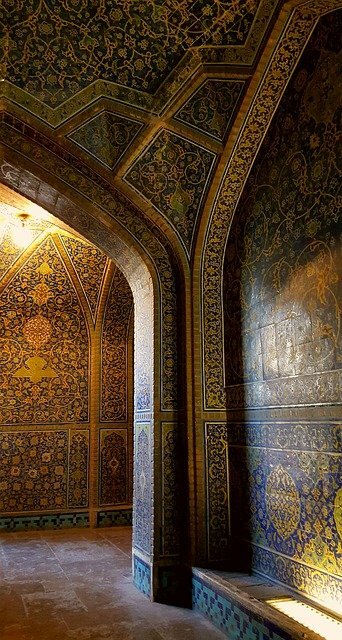 Covering an area of 1,648,000 sq km (636,296 sq mi), Iran is known to be one of the world’s oldest civilizations. Its rich history has had a wide-reaching influence on many countries including Greece, Macedonia and Italy. Iran has been the centre of many empires and many conquests, and according to archaeological studies, the earliest accounts of humans inhabiting this region date back to the Stone Age. The ancient Persians arrived in 1500 BC, bringing great advances in agricultural technology, such as irrigation systems, to the land. The Persians had attempted (and failed) to conquer the Greeks on two separate occasions and in retaliation Alexander the Great then conquered the entire Persian Empire in 330 B.C. In the eleventh century it was conquered by the Turks and then later, Persia was overrun by the Mongols in 1250. However, in the early sixteenth century, the present form of Shi’ism as the Iranian state religion was founded by a religious movement – the Safavids. A new “Pahlavi” dynasty was established in 1925 by Reza Shah. However, this dynasty was short-lived and in 1979, his successor, Muhammad Reza Shah Pahlavi, was overthrown and sent into exile after a successful revolution led by Ayatollah Khomeni. The core concept in Persian culture is called Tarof (or taarof). It is based upon acknowledgement of other people. It shows humbleness and respectfulness. For example, it is always polite to let others through a door before you, or say “No, after you.” The word to use in this scenario is ‘shoma befarmayeen’ (please go ahead). Another situation in which you can come across this phenomenon is while paying at a restaurant. Everyone in the group will offer to pay the bill. The appropriate word here to use is ‘nemishe’ (not possible),and of course, denying offered food and saying, “Oh, no thank you.” (in Persian: na merci) when you really do want some is customary. Most likely they will insist a second time and that time you should act humbly and accept their offering. In Iran, people have two different identities, the first, “zaher” (the public display) is in front of strangers, people dress very formally and conservatively, and do not accept compliments (tarof). The second is “batin” (private) which would be visible at home with family and close friends. People will dress in a much more casual way and speak less formally – Iranians can feel free to be themselves. Women are required to wear head scarves as stated in the Quran; this is to demonstrate modesty. Clothing should be loose, up to knee length, with full sleeves, however three-quarter length sleeves are also acceptable. Men can dress in western attire, but it is advised not to wear short shorts or shirts with sleeves that are too short. In Iran, business attire for men does not usually include a tie. At a social gathering, greet the oldest people first, as age is highly respected. When greeting people, the universal Islamic salaam should be used. The phrase for leave-taking is khoda hafez – “May God protect you”. A more formal way of greeting is ‘Salaam, man [your name] hastam. Az didan-e shoma khoshbakhtam!’ This translates to ‘Hello, I am [your name]. Nice to meet you! The appropriate response is ‘Salamat boshin’ or you can get away with a simple ‘merci’ (a French word, but highly used in Iran, for ‘thank you’. In formal situations, only shake hands with people of the same gender, whereas informally Iranians kiss three times on each cheek. After shaking hands, put your right hand on your chest to show respect. Don’t extend a handshake to a female if you are a male or vice versa. Any physical contact with the opposite gender is forbidden. Shaking hands with children is considered very respectable. In a formal scenario, address people by their title and their last name. A downward gaze is seen as a sign of respect and not a sign of lack of confidence or disinterest. Personal space in Iran is determined by the context, however a good distance between people of the same gender is about one meter, and a good distance between people of the opposite gender should be at least 3 meters. It is customary for Iranians to bring a small gift when visiting an Iranian household or if it’s a special occasion. Sweets and flowers are popular gift choices and always apologise for the inadequacy of the gift (taarof). Talking up your own gift could cause it to be declined; you must also be careful about praising any possession if you interact with an Iranian or visit their home. If you praise something, the owner may try to offer it to you as a present. Another lesser known fact is that when entering a room, it is customary to clear your throat or say any phrase to announce your arrival. This is particularly important if there are women in the house. When it comes to etiquette when visiting people, it’s best to keep an eye on your host’s actions and follow suit. For instance, if he leaves his shoes outside the door when entering a room, remove yours at the door as well. Iranians take their dinner very seriously and have many customs to go along with it. They take pride in their food and usually prepare much more than necessary to help demonstrate their wealth. If you are an important guest, you are most likely to be situated at the head of the table and served first when the food comes out. When eating, to show respect, make sure you finish your food. It is considered very rude to leave food on your plate in an Iranian’s home. Another way to avoid being perceived as rude is to make sure you try a little from all the dishes served, and try not to look at someone else’s meal. Lastly, if you are a vegetarian, Iranian food is probably not for you. Meat is in almost every dish, so it could be a little difficult not to offend your hosts. Once you get to Iran it is recommended to change your currency to Iranian Rials to get the best value but quite often you will find retailers willing to take US Dollars, Euros and GBP, although the exchange rate will not be favourable. Therefore once you arrive it is best to exchange enough money for the next few days to avoid carrying large amounts of cash. Also remember only to use reputable offices when exchanging your currency, these are often found in Airports or exchange agencies around the country. If you take smaller local currency bills with you when exchanging to Rials, many places will give you a lower rate. Credit and debit cards are useless in Iran due to US sanctions, so it is advised to bring hard currency for the duration of your stay. Toman is used while billing at restaurants, shopping, etc but it is not mentioned on any currency note or coin. Toman is simply one tenth of the Rial price. When travelling, avoid taking public transportation during rush hour if you can avoid it, as you can get stuck for a considerable amount of time, especially around Tehran. Similarly, it is best to give yourself plenty of time when taking public transport or travelling around Tehran, as traffic can be a big problem, so make sure you take this into account if you are on your way to an appointment or meeting. Tehran is bordered by mountains in the north and because there are so many cars in the city, there is a lot of pollution. So if you are sensitive or allergic to smells and exhaust fumes in large quantities, take precautionary measures. When paying bills for your shopping, if the salesman offers to gift you the purchased goods, do not take his words at face value (tarof), instead, appreciate his humbleness and offer a fair price. It is rare that you will find aggressive touts in Iran, but if you are shopping in Isfahan you will come across some persuasive sellers – just remember to haggle and stay friendly. Iranian nationals prefer to do business with people they know personally. Thus, they make friends with people before doing business with them. Therefore, it is important to build strong personal and close business associations with capable local partners. A relationship can be established by first inviting your colleague or business partner to a meal, this way you can get to know each other a bit better. You may have the preconception that conversation could be difficult with somebody from a culture so different, but as long as you avoid anything too personal and stick to small talk such as hometowns, work and family, you should be on the right track. In business, experience, education and leadership are the most highly regarded qualities. It is likely that you will have several meetings before a personal relationship is established. It is traditional to exchange gifts with your business associates. Expensive gift giving during meetings could be seen as bribing though, so be careful in your choice of gifts. Flowers and sweets are always a good idea. Make appointments well in advance (3-4 weeks) and keep in mind the important dates and holidays. In Iran, do not make appointments on Friday as Friday is a day of rest. Punctuality is considered very important, but be ready for some delays. Any physical contact with the opposite gender, including shaking hands, should be avoided. Keeping a lowered gaze is a sign of respect. Women should adhere to the dress code specified by the law, which includes covering the head and wearing modest clothes. Business agreements take longer than they usually take to reach in Western countries. Business officials in Iran do not normally wear ties. However, it is not seen as inappropriate if someone does wear one. Pay attention and ask relevant questions to show your interest. Sit attentively and avoid watching the clock, as it shows a lack of interest and boredom. All legal documents and visiting cards should have a Farsi translation along with the English. Iranians are born to negotiate. They not only love negotiating but they see it as a necessary part of every deal they make. The main negotiation tactic used by Iranians is time. If they know that you are under time pressure, they will take advantage of it. No matter how you deal, if you give them the best price or the worst price, they will try to negotiate you down. They enjoy doing it. So if you start negotiating with an Iranian, do not take it personally. You can come and give them a rock bottom price and they will still ask for a discount. If you’re doing business or planning to relocate to Iran we can help you with any of your language translation needs. We offer expert Farsi translators who are on hand to help with any of your translation needs. Contact us today for more information and quotes.